A Caribbean style design and a tropical atmosphere; there are no better elements to describe El Cozumeleno Beach Resort, which offers 252 comfortable rooms. A series of charming chairs aside the pool, a fountain in the middle of a small plaza and a ceramics chess board with pieces the size of an 8-year-old kid, are some of the first elements our guests will notice. 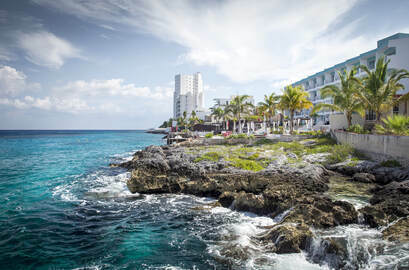 This hotel in Cozumel is situated facing the Caribbean and is only five minutes from the downtown district with all of its many shops and restaurants. A PGA golf course is located directly across from the El Cozumeleno Beach Resort Cozumel. Numerous nightlife options are also available in the local area. The Cozumel International Airport is only a 10 minute drive from the El Cozumeleno Beach Resort Cozumel. Parking and garage facilities are available for the convenience of guests with vehicles. At the hotel, there is an air conditioned small center of physical preparation, an activities center designed for children and an office to make your reservations for diving and snorkeling tours. El Cozumeleno Beach Resort is an excellent option for those who wish to know the reefs at the island and for the experienced divers who look forward to spend a wonderful vacation. Guestrooms. El Cozumeleno Beach Resort offers you 252 fresh and large rooms that have been finely decorated, equipped with air conditioning, television,cable broadcasts, balconies with impressive Ocean Views, comfortable beds, telephone and safe-deposit boxes. Unlimited Food and Beverages (Including Domestic Alcoholic and Non-Alcoholic) at any of the Resort Restaurants and Bars. FREE Scuba Diving Introductory Lessons at the swimming pool. FREE Wireless Internet Access in all public areas and 3 computers available in the Lobby for guests use. Daily activities program: Aqua Aerobics, Yoga, Zumba & Salsa lessons, Kayaking, Snorkel Tour, Bicycle Tour, Beach Volleyball and more! 2 Restaurants (including Buffet and A la Carte Specialties) and 1 Snack Service. FREE HONEYMOON PACKAGE INCLUDES: One bottle of sparkling wine in the room. For a Limited Time ONLY! - Save OVER 45% ADULTS ONLY IN THIS ROOM! Come to the nice El Cocal restaurant and savor buffet style meals through the day, from breakfast to dinner. The spectacular Caribbean Sea view will add an extra value for you. This restaurant serves gourmet cuisine dishes a la carte in a refined atmosphere, the right choice for you, who have good taste and distinction. The dress code is semi formal . Do not forget to make a reservation as soon as you arrive to El Cozumeleno Beach Resort. El Cozumeleno Beach Resort is located in an island in the Mexican Caribbean that came out of a dream: Cozumel. 10 minutes from the International Airport, from the downtown area and the main shopping centers, this hotel will allow you to discover a casual and relaxing atmosphere caressed by the sun, the beautiful sea and a tropical weather.